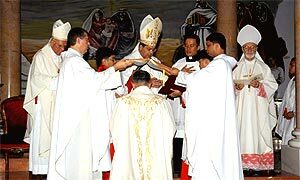 --- Ignatius of Antioch, 1st c. A.D.
On September 2nd, 2005, the Holy Family Cathedral in Kuwait City was transformed into the setting for one of the oldest of liturgical traditions as Msgr. 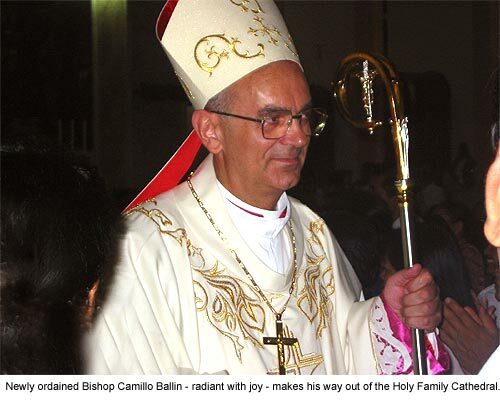 Camillo Ballin, MCCI, was ordained a Bishop and installed as the fourth Vicar Apostolic of Kuwait. 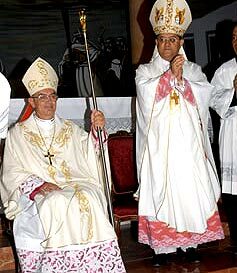 His Eminence Crescenzio Cardinal Sepe, Prefect of the Congregation for the Evangelization of Peoples was Principal Consecrator. 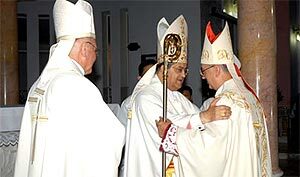 The Co-Consecrators were His Grace Archbishop Giuseppe De Andrea, Apostolic Nuncio Emeritus to Kuwait and His Lordship Bishop Francis Micallef, OCD, Vicar Apostolic Emeritus of Kuwait. Rev. Fr. Giuseppe Sandri, as representative of Fr. General, read the Papal Bull nominating Mgr. Ballin as Vicar Apostolic of Kuwait. 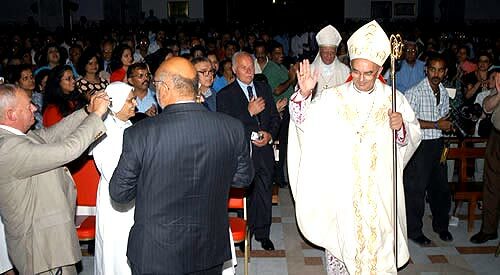 The concelebrating Bishops who specially attended the celebration from outside Kuwait were Archbishop Paul Dahdah, OCD, Vicar Apostolic to Beirut for Christians of the Latin Rite (Lebanon), Msgr. Paul Hinder, OFM, Cap., Vicar Apostolic of Arabia; Msgr. Giacinto-Boulos Marcuzzo, Bishop of Nazareth (Holy Land) and Msgr. 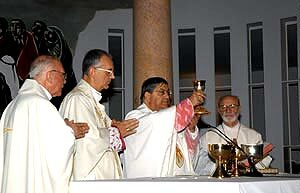 Bernardo Gremoli, OFM Cap., Vicar Apostolic Emeritus of Arabia. Other concelebrants were Fr. Giuseppe Sandri, General Secretary, and Fr. Claudio Lurati, Superior of the Egypt Delegation of the Comboni Missionaries of the Heart of Jesus; Msgr. Lorenzo Piva, official of the Congregation for the Evangelisation of Peoples; Rev. Fr. Robert Paul, OCD, Definitor General of the Discalced Carmelites; Msgr. Francis Jamieson, Msgr. Arnaldo Catalan, the Comboni Missionaries, Rev. Fr. Claudio Lurati, Rev. Fr. Francesco Giacomo Debertolis and Rev. Fr. José Arellano Hernandez, The Priests of the Vicariate, the Salesians of Don Bosco (in Kuwait) and a few visiting priests participated. Among those also present, were the Msgr. 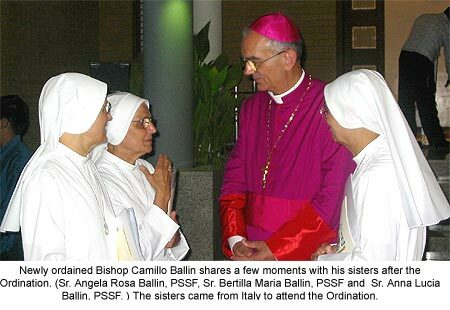 Ballin’s three sisters - who are nuns (Sr. Angela Rosa Ballin, PSSF, Sr. Bertilla Maria Ballin, PSSF and Sr. Anna Lucia Ballin, PSSF), his brother and wife ( Mr. Alfonso and Mrs. Mariuccia Calderaro Ballin ) and friends as well as Bro. Tarcisio Soardi, who had travelled from Italy to partake in the celebrations. The Sisters of the Rosary Congregation and the Apostolic Carmel Congregation, the two religious communities in Kuwait were also present. Church leaders of other Christian denominations brought an ecumenical spirit to the celebration. Choirs for the liturgical celebration included the Jubilate Choir Ensemble, the El Shaddai Prayer Partner Gospel Choir and the Holy Family Choir. Rev. Monsignor Francis Jamieson assisted by Rev. Fr. Windel Pastoriza, OCD, served as masters of ceremonies for the liturgical event. The multi-national faithful representing the parishes in Kuwait were drawn to the impressive liturgy of the first ordination of a Bishop in Kuwait making this event one of the largest gatherings in the Cathedral in recent years. The Consecration of the Bishop-elect took place between the Liturgy of the Word and the Liturgy of the Eucharist. Resp. Psalm: If today you hear his voice, harden not your hearts. Principal Consecrator: Lord, be moved by our prayers. Anoint your servant with the fullness of priestly grace, and bless him with spiritual power in all its richness.We ask this through Christ our Lord. Amen. 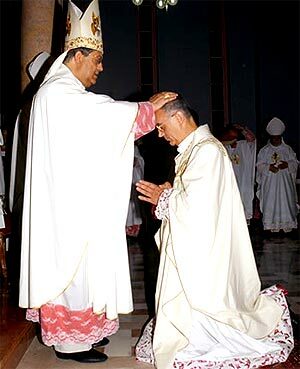 The Principal Consecrator lays his hands upon the head of the bishop-elect, in silence. After the Principal Consecrator, all the Bishops present do the same. 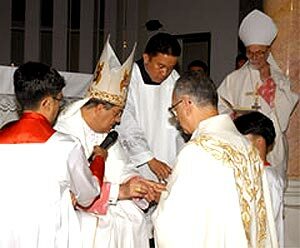 The Principal Consecrator places the open Book of the Gospels upon the head of the bishop-elect; two priests, standing at either side of the bishop-elect, hold the Book of the Gospels above his head until the prayer of consecration is completed. Principal Consecrator: God has brought you to share the high priesthood of Christ. May he pour out on you the oil of mystical anointing and enrich you with spiritual blessings. Then, the Book of the Gospels is presented: "Receive the Gospel and preach the word of God with unfailing patience and sound teaching." Principal Consecrator: Take this ring, the seal of your fidelity. With faith and love protect the bride of God, his holy Church. 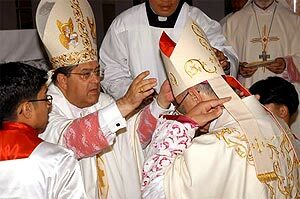 Principal Consecrator places the mitre on the new Bishop's head as a sign of his call to holiness. Principal Consecrator: Take this staff as a sign of your pastoral office; keep watch over the whole flock in which the Holy Spirit has appointed you to shepherd the Church of God. The Principal Consecrator invites the new Bishop to occupy the "Chair". The congregation applauds as the new Bishop takes his place as the fourth Vicar Apostolic of Kuwait. The Principal Consecrator embraces the newly ordained Bishop. 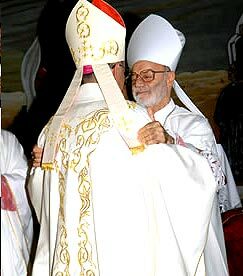 .... and receives the kiss of peace from Bishop Francis Micallef, the retiring Vicar Apostolic of Kuwait, Archbishop Giuseppe De Andrea, the retiring Apostolic Nuncio to Kuwait, the other participating Bishops and all the members of the clergy present at the celebration. ---- The new Bishop blesses the faithful ---- in the Cathedral, in the parish halls and in the compound ..... 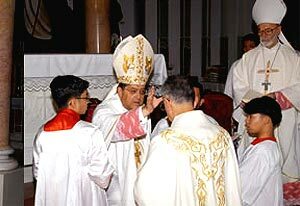 Since the Bishop is ordained to serve the Church in the world, the ordination ceremony takes place before the assembly gathered for the celebration and in communion with the whole Church. 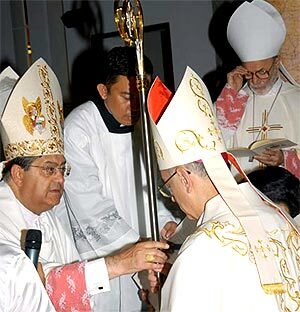 As Vicar Apostolic of Kuwait, Bishop Ballin is entrusted with the care of the Church in Kuwait. There are approximately 150,000 Catholic faithful in the Vicariate. "Feed my sheep." (John 21:15-17) It was this verse that the First Vatican Council cited in defining that the risen Jesus gave Peter the jurisdiction of supreme shepherd over all the Church and ruler over the whole flock. The Bishop, as successor of the Apostles, by carrying out the various offices or tasks entrusted to him, becomes a reflection and messenger of Christ's truth and love. He is the good shepherd who teaches us, sanctifies us and governs us in and through Jesus Christ. Heavenly Father, we thank You for the gift of Bishop Ballin as our Bishop. Shower him with Your heavenly gifts to enable him to carry out the mission entrusted to him. May he shepherd Your people with wisdom and grace. We ask this through Christ, our Lord. Mary, our Blessed Mother, "Queen of Arabia", intercede for your faithful children to become true and powerful witnesses of hope for the Church and the World. AMEN. Copyright © Apostolic Vicariate of Northern Arabia. All Rights Reserved.